First appearances can be and often are misleading. 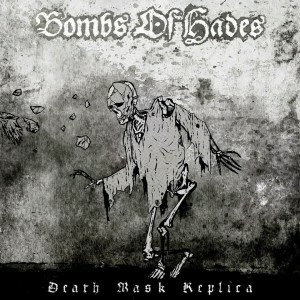 Take Death Mask Replica, for example, the fourth release by Swedish band Bombs of Hades. After noticing the Captain Beefheart-spoofing title and marveling at the tastefully grim and artsy cover, one might expect some kind of experimental blackened death metal in the vein of Chaos Echœs to be hidden within. Instead, what the listener is confronted (and disappointed) with is a straightforward affair that dances on a thin line between death, thrash, and rock’n’roll with just a smidgen of the band’s early crust punk influences mixed in. Still, the formula, on paper, doesn’t sound too bad. In practice, Death Mask Replica feels bland, empty, and unoriginal, as if it belonged back in the nineties alongside the death’n’roll of Entombed’s Wolverine Blues or Autopsy’s and Dismember’s ho-humiest incarnations. What’s worse is that those records, songwriting-wise, remain unreachable peaks of quality for this Swedish foursome. 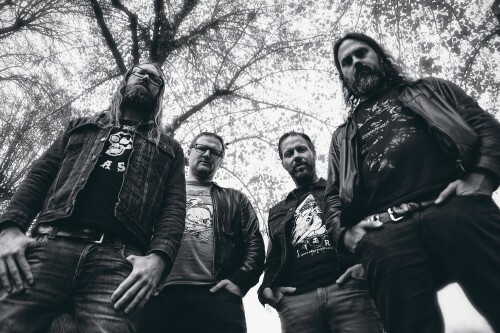 In that respect, Bombs of Hades’s music fits quite well into the current, unrelenting retro-revival wave that’s brought us many rehashed, nondescript bands and albums in the realms surrounding old school (Swedish) death. This particular retro-crazed band is partially redeemed by the way their career has unfolded, starting in 2002 but only releasing their first proper LP in 2010, which suggests that all these easily recognizable influences and characteristics in their sound might not be conscious attempts at reviving anything. Instead, they might just be remnants and atavisms indelible from the minds of musicians stuck in the past (and we all know that good music died in the seventies, anyway). While their sound has gone through several iterations in the past six years, adjusting bits and pieces of their approach on each of the four records released in two-year intervals, just by reading Steel Druhm’s assessments of their previous two albums, 2012’s The Serpent’s Redemption and 2014’s Atomic Temples, it becomes clear that their basic principles are changeless. On Death Mask Replica, Bombs of Hades again provide a fun romp which can scratch just the right spots if the listener is in the right state of mind. When in the mood for something Sodom-like but slower, there’s the crusty title track or the driving “On Pillars of Madness.” Fancy some Motörhead but now with more metal™? Check out “To Walk Through the Pyres” and its bluesy solos. Or maybe you want to thrash around, in which case Bombs of Hades have you covered with some grindcore-like aggression on “Long May You Rot” and “The Venom.” Unfortunately, the slower the songs, the worse the output. This becomes especially obvious during the lengthy, pompous “Burning Angel (Uhuru),” a tune that tries to showcase the band’s songwriting and epic epicness skills but falls short. Sticking with filthy licks, an abundance of thrash, and keeping things simple is preferred. The production, mastering, and musicianship fall in line with the general picture one might have of the band at this point. It’s lo-fi and raw, but with enough punch, buzz, and fuzz to be appropriate for this type of music. Musicianship-wise, Jonas Stålhammar’s raspy, convincing vocals and Magnus Forsberg’s disjointed yet very rhythmic drumming take the spotlight, while the guitars are drowned out by a weird, thin tuning (with an exception being “Old Fires Die”) and diluted with repetitive, uninventive riffs. Puzzling choices, I must confess. Ultimately, the record ends up being nothing more than a collection of occasionally solid throwaway tracks which become tedious and boring over repeated listens. This brings me to my closing point. It’s said that the opposite of love isn’t hate, but indifference. In which case, the worst of fates has befallen Death Mask Replica as I’m completely indifferent towards it. Not bad, not awful, just painfully unremarkable.